My request is for every one of my readers, even if you are not in Nashville: please popularize this image where others from Tennessee might see it. Nashville political class is trying to steal a minimum of $9 BILLION for a public transportation project that won’t work, will cause greater congestion, but will line the pockets of the friends of the city rulers. This project was initiated by the former mayor — now resigned after she got convicted of felony theft on the job! Her nasty legacy — a wide variety of higher taxes for everyone forever — is still being considered. It will be up for a vote May 1. Special interests pushing for these new taxes are running TV commercials and print ads promoting it. The rest of us, people who just want to get by and don’t want to labor under even worse tax burden, got blindsided this year. I wasn’t kidding when saying that everyone will get to pay for this: the taxes are all-encompassing and will hurt almost every person in the metro area…especially those who support local retailers. Not enough population density relative to places where trains work unsubsidized. European cities where light rail works have nearly ten times the population density, and they deliberately handicap their car users with high gas and ownership taxes. Rail space will come partly at the expense of existing roads and will be part of general traffic. As the experience of Minneapolis shows, the rail lines cause greater congestion at intersections. Limited nodes meant that it won’t actually solve congestion between suburbs and downtown – it only serves a small subset of downtown. Ridership will be very limited for a combination of reasons – we know that by the experience of every other metro area. Even if it lives up to the advertising, it would still cover less than 10% of ongoing operating expenses. 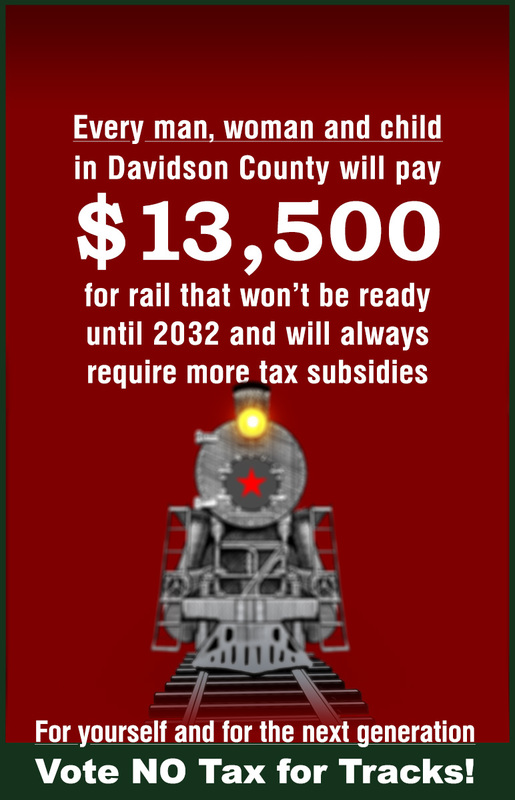 Every time somebody takes a ride on light rail, Davidson County taxpayers would be paying nearly ten times the price of the ticket in subsidies. This entry was posted in Uncategorized and tagged nashville, taxes, theft, transportation. Bookmark the permalink. Cars go where you think you need to go. Trains go where they think you need to go. They read Mein Kampf and thought trains in America could, ultimately, serve a similar cause. I remember when LA opened one of those light rail boondoggles to much fanfare from the media, with the cost of the project mentioned in passing. I did a bit of math and figured out that every single person in the entire US would have to ride the thing three times just to make back the cost of construction. The city of Louisville Ky. needed a new bridge over the Ohio River. “Planning” “Consulting” and “Studies” cost the taxpayers 2 billion dollars and ten years before the first spade ever broke ground. So the same guy that came up with that. Our very own Democrat Mayor for Life Jerry Abramson (who left to work for Obama) Decided we needed a down town “Arena”. It has cost the taxpayer several hundred million every year since it opened. It never has and never will pay for itself . They are ALL of them criminals. If they have a “Public Works” project. It is a scam to steal from the public. PERIOD. Orlando did the same thing with SunRail. They put it up for a vote, and the voters rejected it. They built it anyway. 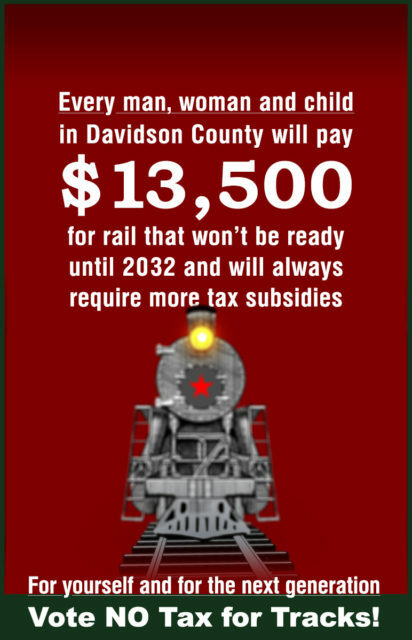 The rail system cost over a billion dollars, and it costs $34 million annually to operate. The trains collect only $17 million in revenue, and that includes fares, advertising on the trains, and renting the tracks to CSX and Amtrak late at night when the trains aren’t running. Only 3,800 people ride the train on any given day. Had that billion dollars been used to buy $20,000 automobiles, they could have bought 20,000 of them to give away and saved $600 million. Then, for the $17 million in red ink that the system bleeds each year, they could have provided each of the 20,000 car owners with an 850 subsidy for fuel and insurance. Living in a metropolitan area with a relatively new light rail system (Phoenix, AZ) – yeah, you really don’t want anything like that unless you want another public project to hemorrhage tax money into and hurt small businesses with the always-delayed construction schedules. You’re all looking at the negatives. The politicians and their cronies only care about the positives for themselves. They’re asking themselves; Who’s going to stop us? Indeed, who? And so this, and more public works projects besides, will go forward until it becomes impossible. How is it not obvious, that once we’ve relinquished such power to government it would not use it and more besides, to your eventual ruin? Fall in line you filthy dogs! Two more reasons: Light rain projects tend to take riders of other transit options. Whatever ridership figures they give, many (often most) of those people are already riding transit. Opportunity costs: Spend that money on trains and you can’t spend it elsewhere. In most cases, spending money on existing bus systems is far more efficient than building rails. Here is the People’s Republic of Western Washington, we are paying for a huge choo choo train network. Original estimate $54 billion, but of course it keep getting more expensive. Our idiot voters actually approved it, but of course there were a lot of lies told to get people to vote for it. That’s our means to produce! Your graft is to blame! We’ll take YOUR guns away! But all the cool places have light rail!